We introduce a simple, label-free cytometry technique, based on the spatio-temporal fluctuation analysis of pixel gray levels of a cell image utilizing the Gray Level Information Entropy (GLIE) function. In this study, the difference in GLIE random fluctuations and its biophysical etiology in a comparison cell model of leukemic Jurkat cells and human healthy donor lymphocytes was explored. A combination of common bright field microscopy and a unique imaging dish wherein cells are individually held untethered in a picoliter volume matrix of optical chambers was used. Random GLIE fluctuations were found to be greater in malignant Jurkat cells than in benign lymphocytes, while these fluctuations correlate with intracellular vesicle Mean Square Displacement (MSD) values and are inhibited by myosin-2 and adenosine triphosphate (ATP) inhibitors. 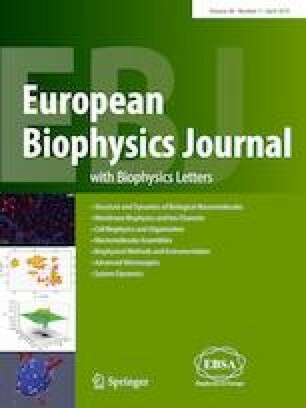 These results suggest that the incoherent active forces acting on the cytoskeleton which cause mechanical dissipative fluctuation of the cytoskeletal and related intracellular content are the biophysical cellular mechanism behind the GLIE random fluctuation results. Analysis of the results in Jurkat cells and normal lymphocytes suggests the possible potential of this simple and automated label-free cytometry to identify malignancy, particularly in a diagnostic setup of multiple cell examination. The online version of this article ( https://doi.org/10.1007/s00249-019-01351-w) contains supplementary material, which is available to authorized users. This study was endowed by the Bequest of Moshe-Shimon and Judith Weisbrodt. The authors declare no known conflicts of interest, financial or otherwise, associated with this publication and there has been no significant financial support for this work that could have influenced its outcome.